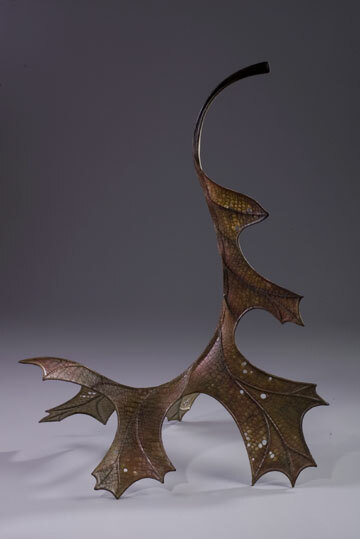 Joyce Shutter received an MFA in Sculpture from the University of Iowa in 1997. She has exhibited her work nationally. About her work, Joyce writs, "I am becoming increasingly aware of the interconnectedness of all things: bird and wind, eye and shadow, breath and bone. Existence � the whole of it � is one breathing entity. Inhale: seeds germinate, clouds billow, rivers flow. Exhale: leaves decay, tides ebb, trees fall; no evaluation, no judgment, no independent opposites, simply a rhythm of complements. Everything in nature, in the universe, is part of the rhythm, just as every breath is life giving. Fleetingly, steadily, each breath gives way to the next. "Each sculpture I make is like an incarnation of a breath, not of the whole life, but containing enough interplay of elements to convey some of the essence and balance of the whole. The materials I use are temporal. Many were once alive. I work in handmade paper and organic found objects, which imbue the work with a mortality of its own. My pieces are made with attention to archival concerns, but require certain conditions to be maintained in order to ensure their longevity, as does the natural world around us. Mortality is a recurring theme in my work. "Another Insignificant Loss" speaks about the paradoxes of death: an event common to all, yet unique to each living thing; necessary for the next season's life, yet final for each individual. 'I am inspired by the many similarities and differences throughout nature. "Arcidae's Purse" was inspired by the ribbed exterior of the bivalve Ponderous Ark (family Arcidae) and the whimsical shape of a skate egg casing, commonly known as a "Mermaid's Purse." "Simulacrum" was inspired by the intricacy of a whelk egg casing, the whirl of gastropods, and spiraling herbivore horns. "The Lure of Shade" is one of my narrative pieces. It speaks of the dangers of choosing comfort over risk. When creating a piece, I attempt to capture some of what I see as the visual music of the world around me, synthesizing a harmony of natural and human design. Although each component is carefully chosen with symbolic references, it is not my intention that those who view my work would dissect and analyze it. Each piece is created with careful attention to the whole, not a puzzle to be solved or a message to be deciphered, but a breath to be inhaled."